ATF Concerned About Drug Cartels Using Hand Grenades in U.S. The drug war in Mexico is deadly enough, and hand grenades have made it even deadlier. 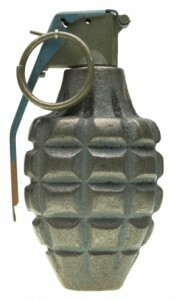 Will we start seeing drug traffickers use handgrenades in the U.S.? PHOENIX — It was a scenario U.S. law enforcement had long feared: A fragmentation grenade from Mexico’s bloody drug war tossed into a public place. Only the grenade thrower’s bumbling prevented bloodshed in a south Texas bar – he neglected to pull a second safety clasp. But the act was proof that one of the deadliest weapons in Mexico’s drug battle is a real threat to the U.S., and investigators are stepping up efforts to make sure it doesn’t happen again. While Mexican drug violence has been spilling across the border in the form of kidnappings and killings, grenades are a particular worry because they can kill large numbers of people indiscriminately, and they are a weapon of choice among Mexican cartel members. Posted: 8/4/09 at 9:27 AM under News Story.